Light therapy involves daily, scheduled exposure to intense levels of artificial light in order to regulate seasonal mood swings, improve sleeping patterns, and produce a general sense of wellbeing. Light therapy causes photo-oxidation; and is, therefore, used as a primary treatment method for neonatal jaundice, eczema, and psoriasis. The light therapy market is segmented into different segments based on light, disease, and geography. 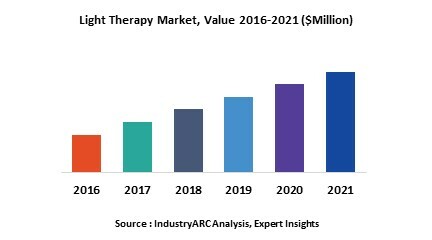 The light therapy market is projected to grow at CAGR of 5.1% during the forecast period to reach revenue of $391m by 2023. Light Therapy is increasingly administered and used as a non-pharmacological treatment for a variety of health related problems such as skin problems, obesity, seasonal affective disorder, depression as well as sleep-related and behavioral problems. Fluorescent lamps accounted for 51% of the total market share with respect to sources of light, while LED lights are projected to grow at a CAGR of 6.0% during the forecast period. When regard to diseases, Seasonal Affective Disorder (SAD) contributes to about 21% share of the light therapy market. The global light therapy market is largely driven by the increased incidences of skin diseases and the growing adoption of therapy. The availability of products through online platforms and growing awareness among end-users about the use of light therapy products to prevent SAD are driving the growth of the global light therapy market. Higher healthcare spending in emerging countries such as China and India are also driving the growth of the light therapy market. Lack of awareness about light therapy and low funds investment by companies in the research field is the key factors restraining the growth of the light therapy market. Some consumers do not opt for light therapy due to the side effects, which is thus hindering market growth. The base year of the study is 2017, with forecast done up to 2023. The study presents a thorough analysis of the competitive landscape, taking into account the market shares of the leading companies. It also provides information on volume shipments. These provide the key market participants with the necessary business intelligence and help them understand the future of the Light Therapy market. The assessment includes the forecast, an overview of the competitive structure, the market shares of the competitors, as well as the market trends, market demands, market drivers, market challenges, and product analysis. The market drivers and restraints have been assessed to fathom their impact over the forecast period. This report further identifies the key opportunities for growth while also detailing the key challenges and possible threats. The key areas of focus include the types of diseases which can be treated, types of lights used, and their specific applications. Some of the other key players in this market are Northern Light Technologies, Photo Medex, Zepter. Carex, Lucimed S.A, Lumie, and Aura Daylight. Acquisition was the dominant strategy adopted by the prominent players of the Light therapy market, crediting more than half of the share of the total market followed by product launch. Lumie, the light therapy specialist, has launched two sleep/wakeup lights named as Spark 100 and Glow 150. Spark 100 offers benefits of sleeping and waking with light, and Glow150 offers the same function but with adjustable sunrise and sunset duration.